Kwiatkowski, L., K. L. Ricke, and K. Caldeira, 2015: Atmospheric consequences of disruption of the ocean thermocline. Environ. Res. Lett., 10, 034016, doi:10.1088/1748-9326/10/3/034016. Technologies utilizing vertical ocean pipes have been proposed as a means to avoid global warming, either by providing a source of clean energy, increasing ocean carbon uptake, or storing thermal energy in the deep ocean. However, increased vertical transport of water has the capacity to drastically alter the ocean thermocline. To help bound potential climate consequences of these activities, we perform a set of simulations involving idealized disruption of the ocean thermocline by greatly increasing vertical mixing in the upper ocean. We use an Earth System Model (ESM) to evaluate the likely thermal and hydrological response of the atmosphere to this scenario. In our model, increased vertical transport in the upper ocean decreases upward shortwave and longwave radiation at the topof-the-atmosphere due primarily to loss of clouds and sea-ice over the ocean. 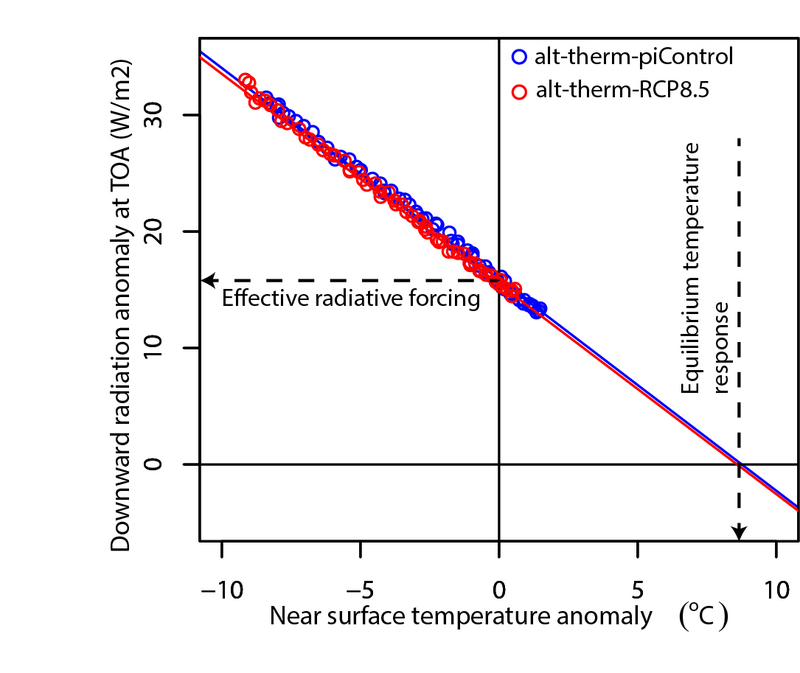 This extreme scenario causes an effective radiative forcing of≈15.5–15.9 W m−2 , with simulations behaving on multidecadal time scales as if they are approaching an equilibrium temperature≈8.6–8.8 °C higher than controls. Within a century, this produces higher global mean surface temperatures than would have occurred in the absence of increased vertical ocean transport. In our simulations, disruption of the thermocline strongly cools the lower atmosphere over the ocean, resulting in high pressure anomalies. The greater land-sea pressure contrast is found to increase water vapour transport from ocean to land in the lower atmosphere and therefore increase global mean precipitation minus evaporation (P–E) over land; however, many high latitude regions and some low latitude regions experience decreased P– E. Any real implementation of ocean pipe technologies would damage the thermal structure of the ocean to a lesser extent than simulated here; nevertheless, our simulations indicate the likely sign and character of unintended atmospheric consequences of such ocean technologies. 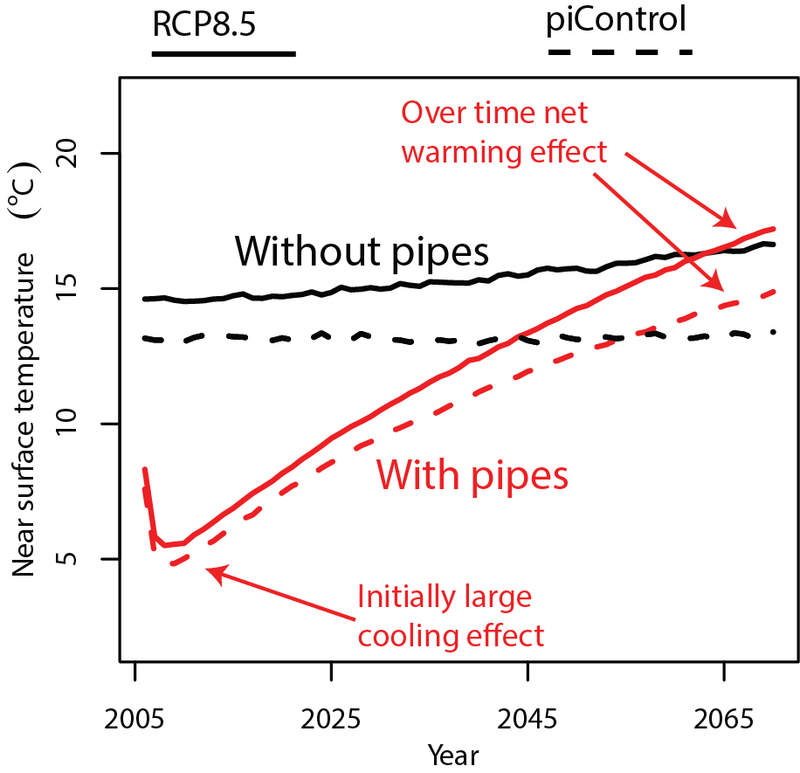 Prolonged application of ocean pipe technologies, rather than avoiding global warming, could exacerbate long-term warming of the climate system.